Words to code by. Thx. I understand what you’re saying and I agree with the principle but I don’t understand how the implementation would work. My exposure to composite applications is limited so I may well be missing something here. A product’s price is a separate concern from it’s stock level and as such both pieces of information are retrieved separately from different services and mashed up in the UI. However what if we wanted to display a list of the 10 most popular products, ordered by their name, in an admin screen of some sort. How would we know what queries to issue to the separate contexts so that we can retrieve the correct information from each and ensure that it can be reliably correlated in the UI? This is one of the easiest reading about SOA I’ve seen so far. It is a very good post indeed, thanks. Having seen Greg Young at oredev about CQRS, it looks like such architectures just play well with what you are writing here. 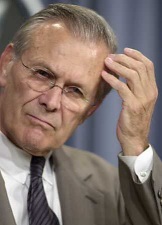 On a sidenote, mentioning known unknowns seems to be impossible these days without referencing Rumsfeld. His “Old Europe” is also a very memorable quote. The guy was probably a philosoph. It’s good to see it state clearly what SOA is not. I don’t know how many years it will take to make it clear/obvious/published;-) The SOA wrap around procedural systems is still alive, and still considered as a good practice in some environments. I hope not much longer. “Any piece of data or rule must be owned by only one service” is easy to say but very hard to implement or work with, we have to be pragmatic. Your example of Product price and its availability in stock is a good example; I better wrap them together if my business needs are asking me the same set of info again and again (Scale and Performance reasons). Now If I need to display the Product Price in the UI, I will still try to use the same service for getting that data also provided if I code the service correctly. I don’t want to be harsh here, but pragmatism is a common excuse for avoiding change – just because something is hard to do, doesn’t mean that it isn’t the right thing to do. We are on the right track thanks to person like you Udi. Only through knowledge we can improve our artifact. It is wrong (perhaps intellectually lazy at best) to dismiss the role of OOD in Service design by harping on about a particular fetish – entity modelling or the dreaded “BOM” from RUP. It’s not individual business objects (or entities if you prefer) like Customer, Product, Order etc that are the starting point for defining your services. Instead, it is the OO domain model which if modeled well, will be specific to your business problem domain and be loosely coupled between business components that have high value (to your business) business object(s) at their core. If the domain model follows what Peter Coad et al called the DNC (Domain Neutral Component) shape, you will have loosely coupled components with significant behavior that you can model your services on. Don’t underestimate the required effort or the benefit in doing this step. 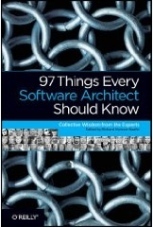 It’s rather ironic: Those who don’t bother (or simply don’t realize they need to, or were told there is not enough time) doing up front domain modelling for the design of significant business applications usually end up with hard to maintain and often procedural code rather than an easy to understand, easy to maintain, clean implementation of OO. And so it is the same for SOA services – history repeating itself. I think that we can agree that the prerequisite of deeply understanding the business (which is often achieved through modeling processes) is critical for the success of most large software projects. Those who only superficially scratched the surface would end up in trouble no matter whether they did (or said they were doing) OOD or SOA or any other TLA.